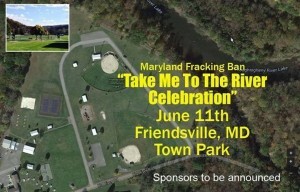 Maryland Third State to Ban Fracking! Maryland is on track to become the third state to ban hydraulic fracturing, or fracking, for oil and natural gas, after the Senate voted 35-10 on Monday for a measure already approved by the House. The bill is now headed to Republican Gov. Larry Hogan, who is in favor of a statewide fracking ban. Hogan, who once said that fracking is ” an economic gold mine,” stunned many with his complete turnaround at a press conference earlier this month. “We must take the next step to move from virtually banning fracking to actually banning fracking,” the governor said. “The possible environmental risks of fracking simply outweigh any potential benefits.” Once signed into law, Maryland would be the first state with gas reserves to pass a ban through the legislature. Don’t Frack Maryland, a coalition of more than 140 business, public interest, community, faith, food and climate groups, has campaigned vigorously for a statewide ban through rallies, marches, petition deliveries and phone calls to legislators. Supporters of fracking say it creates jobs and provides energy security. “Denying Maryland consumers, businesses and job-seekers the benefits that come with in-state energy production through hydraulic fracturing shuts the door on an important share of the American energy renaissance and western Maryland’s future economic growth,” Drew Cobbs, executive director of the Maryland Petroleum Council, told the Associated Press after the vote. But opponents of the drilling process, which involves shooting highly pressurized water and chemicals into underground formations to release oil and gas, cite health and environmental risks such as air and water pollution and earthquakes. Fracking does not currently take place in Maryland but a moratorium on issuing permits ends in October. Elisabeth Hoffman of Howard County Climate Action said that alarming research about fracking’s harms has emerged during the state moratorium, adding that “voices from fracked states were sounding the alarms as well.” “We are relieved and overjoyed that the state Senate has said NO to fracking,” she added. Yesterday’s vote was widely applauded by environmental groups especially in light of the Trump administration‘s apparent assault on environmental regulations. “Despite Trump’s efforts to block climate action and roll back protections for people and the planet, communities in Maryland took matters into their own hands. This is an incredible victory that speaks to the power of grassroots organizing to take on the fossil fuel industry. Fracking is a reckless practice that threatens health and safety while intensifying the climate crisis,” 350.org Fracking Campaign coordinator Linda Capato Jr. said. Capato is urging a similar movement worldwide. Governor Larry Hogan made the fracking ban official today by signing House Bill 1325 into law. This action makes Maryland the first to pass legislative prohibitive action in a state where gas reserves are available. It’s certain that other states reluctant to begin horizontal gas drilling will be looking closely at Maryland as an example to follow. What was deemed a strong bipartisan effort resulted in placing the health and safety of Maryland residents first. The state-wide movement to educate lawmakers and citizens to the controversial practice has proved successful. Thank you to everyone who played a role in this historic accomplishment.